Riobamba is the capitol city of the Chimborazo province. It is a traditional, old fashioned city, that will entrance you with its unique charm and boredom. The Chimborazo province has the largest population of indigenous people in Ecuador. Riobamba has a population of nearly half million. 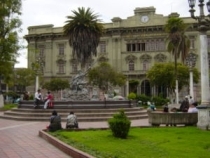 Riobamba is the trade centre of the agricultural industry in the province. Nestled amidst the Andes with many scenic roads around with beautiful views. Riobamba's manufactured products include textiles, handicrafts, leather goods, beer, and dairy products. Riobamba was founded in 1534, by Spanish conquerors, and was originally called Cajabamba. The city is also noted for being on the rail line between Quito and Guayaquil and most notable near the famous Alausi railway line with its' famous Devil's Nose 'switchbacks'. For more information about Riobamba see Wikipedia, the free encyclopedia.